Celebrity chef Jacques Pepin has spent more than 60 years cooking up a storm, preparing classic French cuisine both in France and the United States. One of the most respected chefs in the world, his reputation as a master of French cuisine only slightly exceeds his reputation as one of the nicest people in the business. No one has a bad thing to stay about this adorable Frenchman. Most people will recognize him as Julia Child's cooking sidekick. He's also cooked for heads of state. Jacques has won numerous awards, including two of France's highest honors - he is a Chevalier de L'order des Arts et des Lettres (1997) and a Chevalier de L'ordre du Merite Agricole (1992.) In 2004, he received France's ultimate civilian recognition, the Legion d'Honneur. He's penned 26 cookbooks and his most recent, "Essential Pepin," also runs as a cooking series on PBS. Jacques loves teaching as much as cooking and, since 1998, has been Dean of Special Programs at the French Culinary Institute in New York. He is also an adjunct faculty member at Boston University. 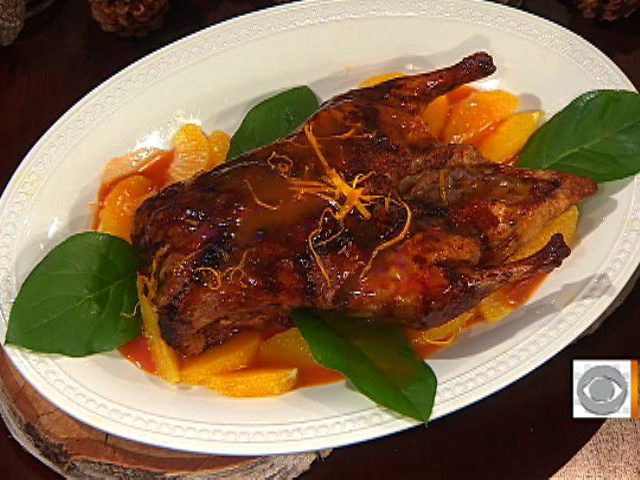 In "THE Dish" on "The Early Show on Saturday Morning," Jacques showcased a special dish for New Year's Eve - his ultimate - Roast Duck with Orange Sauce. Many restaurants serve duck breasts rare and the legs braised, but the classic way of preparing duck for the holidays is to roast it whole and serve it with orange sauce. It is excellent with wild rice. Remove the neck, gizzard, liver, and heart from each duck and set side (you can enjoy the sauteed livers on bread with a glass of wine while you are cooking, if you like). Cut the wings off each duck and reserve. Season the ducks inside and out with the salt and pepper. Place breast side up in a large roasting pan and add the water. Roast for 1 hour. Pour off all the fat that has accumulated in the pan, or remove it with a bulb baster. Continue roasting the ducks for another 45 minutes. MEANWHILE, FOR THE SAUCE: Cut the duck necks, hearts, and gizzards into 2-inch pieces. Cut the wings apart at the joints. Heat the oil in a heavy pot until hot. Add the duck parts and sautee, turning occasionally, for about 20 minutes, or until they are browned on all sides. Add the vegetables, herbs, and garlic and cook for 5 minutes. Stir in the tomato paste and flour, mixing well. Add the stock and wine and bring to a boil, then reduce the heat and simmer slowly for 1 hour. Strain the sauce. (You should have about 3 cups.) Set aside. Remove the rind of one of the oranges in strips with a vegetable peeler, taking care not to pick up any of the white pith underneath the skin. Stack a few strips at a time and cut lengthwise into thin julienne strips. Blanch the strips in a saucepan of boiling water for 1 minute, then drain in a strainer and rinse under cold water. Set aside. Squeeze the juice from the peeled orange and another of the oranges; you should have 1 cup juice. Using a paring knife, peel the 3 remaining oranges right down to the flesh. Separate the segments by cutting down along the membranes surrounding the segments, so that you have only pure flesh sections. Set aside. Skim the fat from the duck cooking juices and add the sauce to the roasting pan. Bring to a boil, stirring to melt all the solidified juices, then strain again. Combine the sugar and vinegar in a large heavy saucepan, bring to a boil, and boil for about 4 minutes, until the mixture turns a pale caramel color. Add the orange juice and currant jelly and bring to a boil, then add the strained sauce and simmer for about 8 minutes. Taste for seasoning, add salt and pepper if needed, and stir in the Grand Marnier. Finally, add the butter bit by bit, shaking the pan as you add it so it blends into the sauce. Spoon some of the sauce over the ducks. Sprinkle the top with the julienned orange rind and surround with the orange sections as garnish. Carve at the table, or present the duck, then bring back into the kitchen to carve. Serve the extra sauce on the side. FOR BONUS RECIPES FROM JACQUES, GO TO PAGE 2. Potatoes thicken the batter of these crepes, giving them a smooth, soft, and creamy texture, which perfectly complements the caviar. The amount and type of caviar can be varied to suit your pocketbook. To make the dish superlative, I use a little of the expensive black caviar from sturgeon-beluga, osetra, or sevruga - as a garnish. FOR THE CREPES: Put the potato in a saucepan with water to cover and bring to a boil. Cover, reduce the heat, and boil gently for 45 minutes, or until the potato is tender. When the potato is cooked, drain it, peel, and press through a food mill or a ricer into a bowl. Add the flour and eggs and mix well with a whisk. Mix in the milk, salt, and Tabasco. Heat 2 teaspoons of the oil in a nonstick skillet. When it is hot, add about 1/4 cup of the crepe batter, which should spread to create a circle 4-1/2 to 5 inches in diameter. Cook over medium heat for about 3 minutes on each side. Transfer to a cookie sheet and keep warm in the oven while you make 5 more crepes with the remaining batter and oil. To serve, arrange the warm crepes on individual serving plates. Spread the top surface of the crepes with red caviar (about 2 tablespoons on each), extending the caviar clear to the edges. Mound 2 rounded tablespoons sour cream in the center of each crepe. Sprinkle with the chives, spoon about 1-1/2 teaspoons of the black caviar onto the center of each sour cream mound, and serve immediately. Remove and discard any damaged beans or debris and wash the remaining beans well in cool water. Drain the beans, place them in a bowl, cover with cold water, and soak for 3 hours. Drain the beans, put them in a stainless steel pot with the 4 quarts water, and add the rice. Cut the pancetta or bacon into 1/4-inch cubes and add them to the pot. Bring to a boil over high heat, uncovered (this will take about 20 minutes), stirring occasionally. Skim off and discard any foam that rises to the top. Reduce the heat to very low, cover, and cook for 1 hour. Add the onions, garlic, herbes de Provence, chili powder, tomatoes, and salt to the pot, stir well, and bring to a boil. Reduce the heat to very low, cover, and cook for 1-1/2 hours. Mix together the oil, vinegar, and Tabasco in a small bowl and add to the soup. Divide the hot soup among individual bowls. Top with the banana slices, sprinkle on the cilantro, and serve. I call this delicious drink my New England cold remedy; it's my prescription for getting rid of a stuffy nose or sore throat. Combine the cider, allspice, cloves, and cinnamon sticks in a saucepan and heat over medium heat until the mixture is just below a boil. Cover, remove from the heat, and let steep for 5 minutes. The allspice and cloves will have floated to the top; remove and discard them. Pour 2 tablespoons of the bourbon into each of six mugs and pour some of the cider mixture over it. Spoon a few cinnamon stick pieces into each mug and serve.